Offshore Sailing School’s comprehensive sailing courses are perfect for beginners and small boat sailors looking to earn their sailing certification. Learn to sail in Florida and our expert, caring instructors will take you through the intermediate level for US Sailing Certification aboard award-winning Colgate 26 sailboats, designed for training and safety ensuring a comfortable learning environment while you work towards your sailing license. 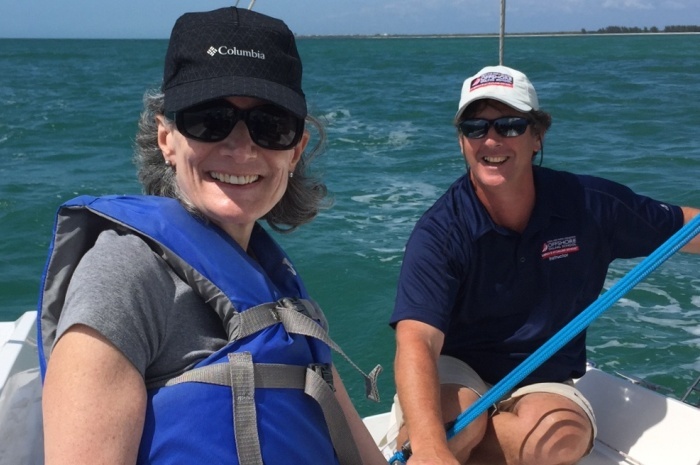 This very comprehensive experience covers all you need to know to get started in sailing and earn US Sailing Basic Keelboat Certification – in two full weekend days. Our OSS 101 course is a fun, fast and very rewarding experience, guaranteed to get your sailing dreams adrenaline flowing. The five-day schedule provides the same course and US Sailing Basic Keelboat Certification, plus an introduction to navigation. You learn on a relaxed schedule, in half-day sessions Monday through Friday, giving you the opportunity to enjoy other activities and share non-sailing pursuits at one of our Florida sailing school resort locations. “Really a top-notch, customer/student oriented business. Academics and professionals whose careers immerse them in learning have applauded Steve Colgate’s teaching method after taking Offshore Sailing School sailing courses. As soon as you sign up you receive the US Sailing Basic Keelboat textbook and our comprehensive 120-page Fast Track to Sailing textbook written by Steve and Doris Colgate. You also receive a packet of information on what to wear and bring, your course schedule, and information about the location. To give you a broader visual understanding before you arrive for the course, especially if you are taking the Accelerated 2-Day Learn to Sail Course, recommend taking our Learn to Sail Online course developed by Steve and Doris Colgate. This interactive four-hour program is provided by the BoatUS Foundation, the premier online boating education provider in the United States. All Learn to Sail certification courses include a classroom session each day of the 2-day course and the first four days of the 5-day course, before you go out on the water. 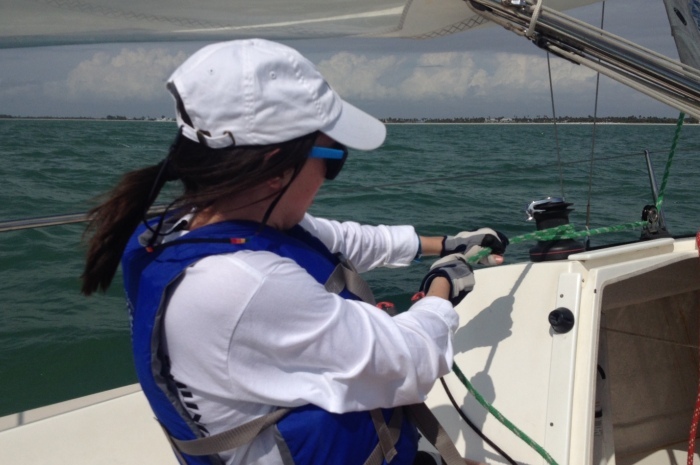 These sessions reinforce what you studied in the book, and graphically explain the “whys” (not just the “hows”) of what you are about to learn on the water on your way to earning your US Sailing Certification. During these sessions, a model of the Colgate 26 and videos from the Online Learn to Sail Course are utilized to further clarify what you studied. If you choose the 5-day schedule, on Friday you and your classmates put all that you’ve learned to the test as you work as a team to chart a course and sail on your own without the instructor aboard. This is the culmination of an experience our graduates describe on evaluations as truly amazing. The award-winning Colgate 26 sailboat is the brainchild of Offshore Sailing School founder and National Sailing Hall of Famer, Steve Colgate, who asked renowned naval architect Jim Taylor to draw its lines for production. The year it was launched, the Colgate 26 was chosen by the U.S. Naval Academy and then the U.S. Coast Guard Academy for training plebes and cadets. Learn to sail in Florida with this fun boat with ergonomic comfort, excellent safety features, ease of handling, outstanding performance, and sophistication. The Colgate 26 also makes it easy to move up to larger sailboats quickly. The Learn to Sail Certification course takes you through the intermediate level, covering more than you thought possible. Depending on weather conditions and the learning pace of all in your class (maximum four per boat per instructor), the following knowledge and skills are learned and practiced. Certification: Basic Keelboat Certification from US Sailing, the governing body of sailing in the United States, is included in your tuition package. Please visit Our Locations for more information. Rates vary by season and location, and include all the elements listed below. Not included are meals, travel and other expenses you may incur. The 2-day Learn to Sail course at any of our Florida locations is $1170 per person without accommodations, resort fee and taxes. All else above is included. If you are flying in for a mini-vacation getaway or looking forward to a staycation near home, packages with accommodations change seasonally. Current 2018 packages in a Harbourside Room at South Seas Island Resort on Captiva Island, Florida – including the course, accommodations and more – range from $1395 to $1655 per person double occupancy, $1600 to $2125 single occupancy. The 5-day Learn to Sail course at any of our Florida locations is $1545 per person without accommodations, resort fee and taxes. All else above is included. Current 2018 packages in a Harbourside Room at South Seas Island Resort on Captiva Island Florida – including the course, accommodations and more – range from $2010 to $2760 per person double occupancy to $2430 to $3930 single occupancy. During summer months your fifth night is free and included in the lowest rates above. Sample schedules are below and may vary by location. At some locations the morning classroom sessions start at half-hour later. A detailed schedule, with when and where to meet information, is sent when you enroll. The two-day course is offered on Saturday and Sunday each weekend and includes a 1 hour 50 minute classroom session and two 3-hour on-water sailing sessions both days. Plan to arrive late afternoon Friday. If you are flying in and out, you should consider adding a Sunday night stay to your package to avoid the rush getting to the airport; then fly home Monday morning. This course is structured to give you more time to study and enjoy the amenities at the resort. Courses are held Monday through Friday, with 1 hour 50 minutes hours of classroom, and 3.5 hours of on-water instruction Monday through Thursday, and a test sail without the instructor aboard on Friday. Plan to arrive Sunday afternoon. Although the course ends Friday, you may want to add an extra day at the end of course to complete your vacation. On-water sessions may alternate mornings and afternoons. You will be assigned to either Group 1 or Group 2 at your first classroom session. 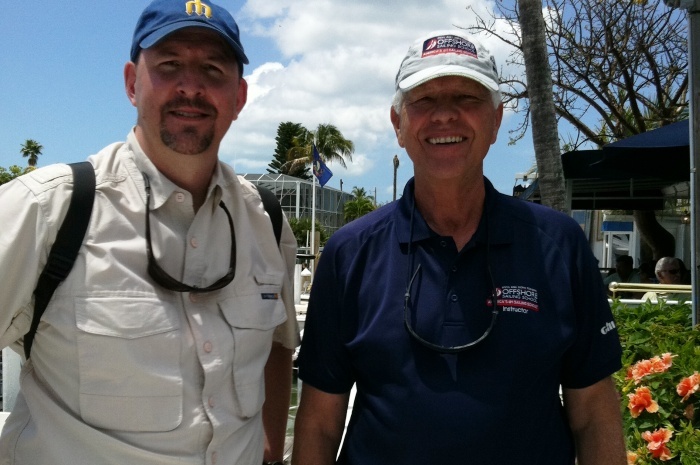 Offshore Sailing School knows we cannot thrive without great employees and products. All graduates are asked to fill out an evaluation at the end of the course. The following testimonials come from those evaluations and individual correspondence with recent graduates of Learn to Sail Certification Courses. Many of our alumni are happy to correspond by email or phone with you. If you would like us to put you in touch with anyone below, please call 888-454-7015 or email sail@OffshoreSailing.com. For years I have wanted to take this course. It was better than I expected. The Colgate 26 is a great boat to learn on. The textbook that was provided was also excellent. Andy, my instructor, could not have been better. The Learn to Sail class was an excellent way to spend quality time with my Dad, and learn a great new skill. Barbara made the class easy, efficient and self-rewarding! What a great new way to see and experience New York City. It has been two years since I took the Learn to Sail course in Manhattan, and I cannot believe what a great foundation it has been. It still takes my breath away to relive all those memories! 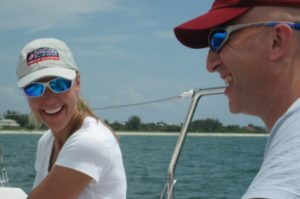 The sailing adventures that opened up for me have really changed the course of my life and that of my husband, as well. I now own my own 30-foot sailboat, and we both agree we are as happy as two kids again. Thank you and thank you again! My father recently passed, and sailing was a way of honoring him. My father and I shared many great moments together day-sailing, often without a word spoken. The mutual peacefulness we experienced required no words. Offshore Sailing’s Cory Crowner helped me regain the confidence to sail again with new adeptness that would surely make my father proud. Absolutely fantastic experience! Totally exceeded my expectations. My wife and I had never sailed before but now I am HOOKED! Our instructor was personable, professional and patient. He gave us the encouragement and confidence we needed. We will definitely be taking another course!! I had never before been on a sailboat on the ocean, or sailed ever. By the end of the course, my husband and I had learned a new language and a new skill with surprising speed, and on our test sail on the last day we had a BLAST! We were confident and then DOLPHINS surrounded our boat. Magical!! Our instructor’s knowledge and unflappability put us all at ease. Jacek is a truly gifted and patient teacher!!! This was a bucket list item for me! My recent retirement has allowed me to realize a dream that has been tucked away from the 60’s when I lived in the Midwest. I have aspired to attend the Colgate school for many years. Bill was a wonderful instructor. He is quite knowledgeable and very patient. I liked the way he would review topics previously covered. The visual aides were very helpful. The instructor and boat were both excellent. Jacek did a terrific job of getting everyone involved and rotating through the different aspects of ship handling. I learned far more than I’d hoped. The location (Captiva Island, FL) was great as it afforded the ability to actually sail in the Gulf. I would highly recommend this course to anyone as it will only increase your knowledge, skills and confidence to handle your own boat! Opened up a whole new world. Simply wonderful! We had taken a shorter sailing course in DC over a weekend. I would advise anyone who really wants to learn sailing to avoid those and go with your course. It would have been money saved to do your course; more time on the water, BETTER vessels, instructions, gear, classroom, etc. This company is awesome, and the people are dynamic and thorough from my first phone experience to meeting Steve Colgate himself. This course exceeded my expectations. I looked forward to each day of class and the challenge of sailing ever changing conditions with a very experienced and knowledgeable instructor. Never once did I feel I was at risk. We were always sailing in control while in high wind conditions. Simply a great overall experience of learning. I was a little apprehensive about the course, as I had no prior sailing experience, but our instructor immediately set my mind at ease. She was incredibly patient and knowledgeable, and she made our classroom and on-water sessions fun! Her enthusiasm and love of sailing was contagious, and I enjoyed every minute of my experience. Now that I’ve completed the Learn to Sail course, I can’t wait to participate in a cruising course! Everything was first rate. Offshore Sailing School is a uniformly exceptional organization. I would recommend them to anyone. The instruction, staff and course were all well done. It was an absolutely great week. My 18 year old son had been hesitant about going “to school” over spring break, but he LOVED it and is totally hooked on sailing. Mike was a fabulous instructor and well exceeded our expectations. This is what I had been looking forward to for a long time. It was great. I finally found something I love. The best three days of my life. I want to come back to learn how to do the big boat too. I have had a remarkable week learning to sail at Offshore Sailing School on Captiva. This experience has enabled me to feel very confident and knowledgeable for all future sailing endeavors. Thank you for having such a great staff (especially Rick) and facilities that were so helpful in allowing me and my sister and father to learn how to sail well. My sisters and brother and I gave this course to my father for his 70th birthday – Rick and Offshore Sailing helped us provide the perfect gift to a father who has given so much to us. The Offshore Sailing School’s Learn to Sail course exceeded my expectations. Having no prior sailing experience, I am beyond impressed with my knowledge and ability leaving the course. I give it my highest recommendation. Rick was superb in the classroom and on the water. He was knowledgeable and skillful during the entire five days. I cannot believe the amount of information about sailing I have obtained, the bonding with my two daughters and the fulfillment of the goal of my 70th birthday gift from my daughters. Bart and Shane had excellent knowledge, were able to pass it to others, patient and fearless! Took three days to wipe the grin off my face. Bart was an absolute professional sailing instructor. He was calm and patient both on the water and in the classroom. These were essential qualities for us, as a group, as we were comprised of myself and a friend and our 10 year old sons. Thanks to Bart, we all passed the test and enjoyed ourselves a lot. I was apprehensive when booking the course because I thought three full days of sailing instruction (or any instruction) would be challenging for my 10 year old. The reality was that we had a great time and look forward to sailing together this summer! Jim did a great job explaining the fundamentals of sailing to my family. We came to this course without any prior sailing experience, but Jim ably explained these novel concepts with patience and clarity. On the water, he patiently worked with each of us until we understood the basics and operating a sailboat. Everything about my experience with Offshore Sailing was great. The team did a great job getting my family ready to sail by ourselves. I plan to take the next course next year to continue my education and improve my skills. I’d recommend Offshore Sailing School to anyone. Our overall experience was excellent! My two boys loved being on the water and wanted me to extend our vacation so they can keep on sailing with their instructor. The staff of Offshore really made the entire experience seamless and effortless from initial inquiry phase through booking the course and finally getting out on the water. Mike was incredibly patient with me, a non-sailor, who had to learn everything from the beginning. I loved every minute of it and can’t wait to do the next level course. This is an amazing program. Thank you!